If you like spinning, lightning, draining enemies life right from their faces, and dealing with end game - Welcome! -Vaal Pact! Now we can deal with reflect!! Now you can choose between 2 versions of this build, RT or EO. RT - cheaper/less damage up to t15. EO - little expensive to get accuracy on gear/more damage/end game viable. - WE GOT BUFF!!! Now Brain Rattler has 20% lightning pen!!!! GREAT! - The Wise Oak FLASK!!! - Have a lot of currency and want to increase DPS? - Alternative 3 aura tree is just for you! - Video section is added! Excavation is first, more will be soon. - PoB updated, now there are 2 versions with BiS items and decent. why do you use Blood rage? Blood Rage is a great source of attack speed and frenzy charges for faster clearing. Lately, a lot of you are asking if it's mandatory or not. Well, in this build nothing is mandatory besides Brain rattler mace. You can adjust things up to your preferences. 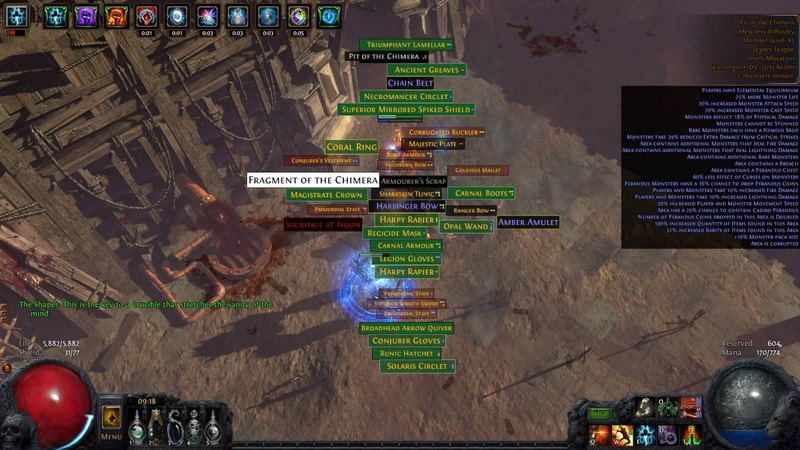 Can you farm Uber lab? - drop Phys to lightning gem, WED, and wear Sibyls lament instead of Death rush. If your res are matched (like 136% all) be sure to use Wise Oak flask all the time. - Lacking int? Put Brute force solution Jewel in the socket in the Duelist area. - If you lack mana for Leap slam, link it to the Blood magic gem. - 155 int is no longer required, only 111, if you struggle with it, just put Brute force solution Jewel under Duelist area socket. !!! SPIN 4 LIFE !!! First of all, this leveling section is based on what I'm personally doing. Going 2handed melee right away. 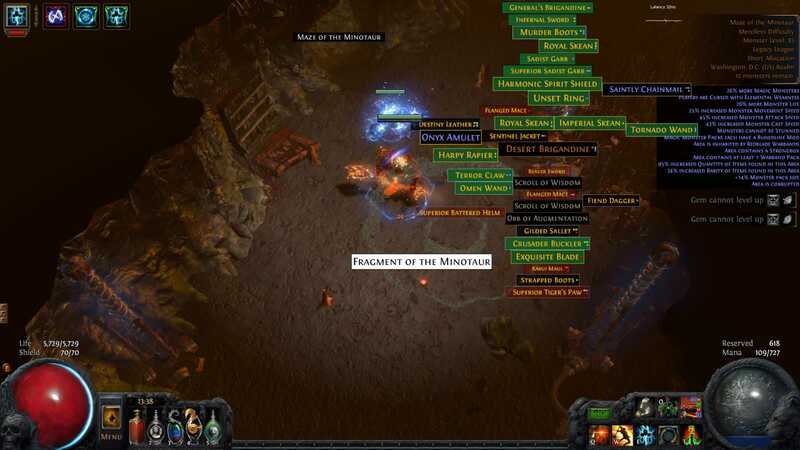 List of useful uniques: Limbsplit (lvl 13), Reaper's pursuit (lvl 33), The Cauteriser (lvl 40), Kaom's primacy(lvl 58), Hezmana's bloodlust(lvl 64). At the beginning of the league, you can't get Brain rattler, so use one of these or a good high phys 2 handed axe/mace. - At lvl 12 grab Sunder from Nessa, we will use it until cyclone is comfy. - lvl 20~ you'll get Resolute technique Keystone, no missing from now on! - With Cauteriser axe, you can deal with Cruel, Merc labs, and achieve lvl 63 for Brain rattler. - The last move: grab Devotion, Bone breaker, Bloody bludgeon, missing life nodes and jewel sockets. - If your INT is insufficient, grab any +30 INT nodes on the tree, until you can get enough from gear. - Go for Uber Lab once your life reaches 5k+ If you're missing trials - go to the Global channel #820, people share trials for free. If I missed something - Please let me know! I will post Best in slot items here. You can change them according to your wealth lvl. Good damage, 50% phys to lightning, 20% lightning pen. This build revolves around it! Kaom`s heart is BiS, gives ton of flat HP, bringing us to the point of 8k+ HP. 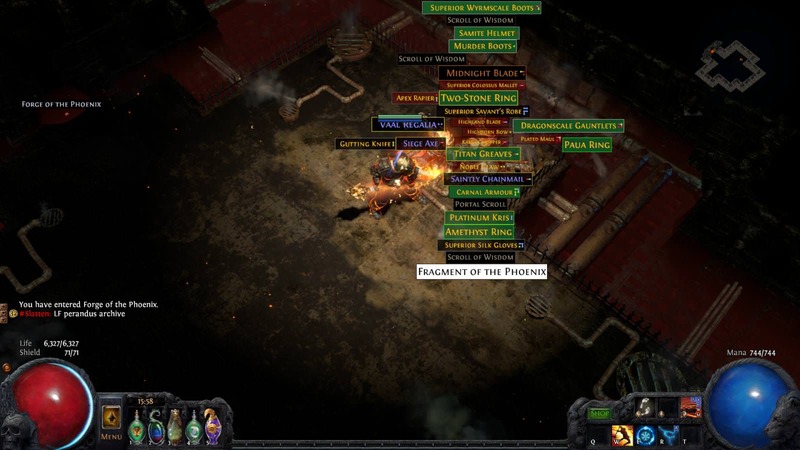 Belly of the beast can be a good chest until Kaom is available. 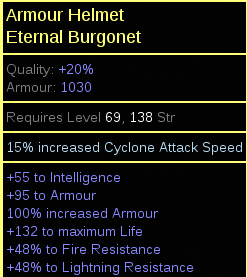 Eternal Burgonet, with high life roll, 2 res, some int if you`re lacking it. Best enchantment is 15% cyclone attack speed. Belt of the Deceiver is BiS on my opinion. Intimidation increases monsters damage taken by 10%, Crit survivability, damage increase, and life. If you feel you`re lacking survivability, you can always grab leather belt with high life rolls, weapon elemental damage, and res. 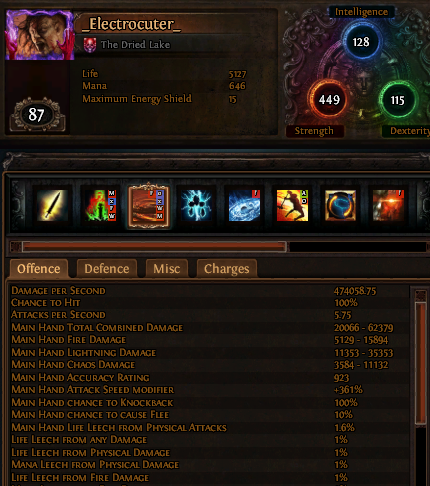 But even with Belt of the Deceiver, you can achieve almost 9k life at lvl91. Death rush is totally great due to Onslaught (20% increased movement, attack and cast speed), also grants 30sh% chaos res, some life, and armor. The second ring is really important, it MUST have life, FLAT PHYS, and 2 res. 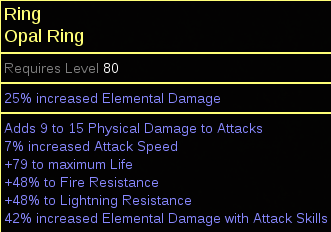 Elemental damage and attack speed is secondary. So, why is having flat phys on a ring is so important? - Because it will be increased by phys modifiers firstly, then converted to lightning and increased again by elemental modifiers. Spiked gloves are great because of built in 20% increased melee damage. First of all, you are looking for life and needed res. The secondary is attack speed and flat phys. Super OP and luxury - corrupted with Curse enemies with elemental weakness on hit. THIS IS GLOBAL, any damage dealt to a monster curse him! 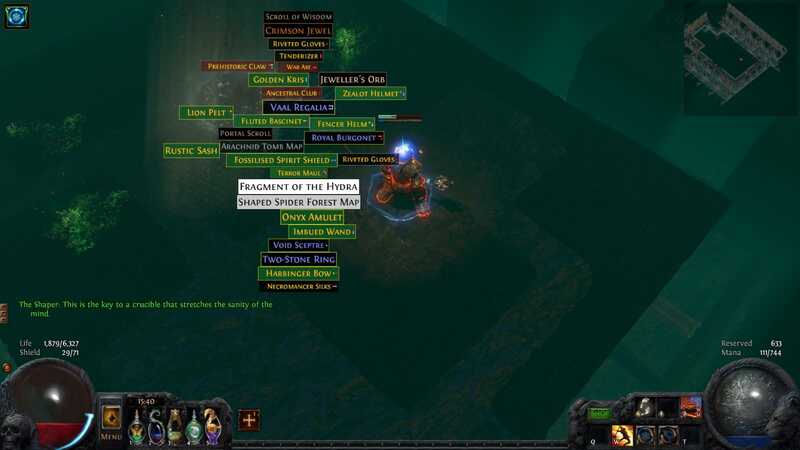 If you`ve found gloves with needed stats + this corruption - take it! screw spiked gloves! 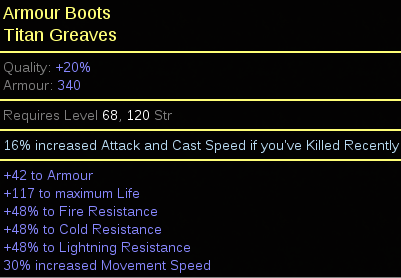 Titan Greaves/two toned boots are best. 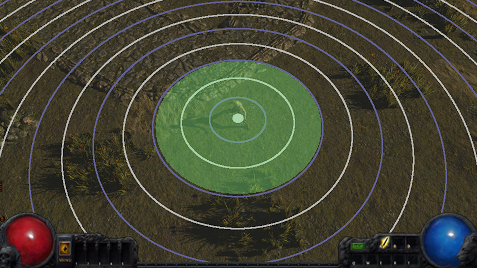 Max life roll, 30% move speed (no less than 15%), 2 or 3 res. Best enchantment is 16% increased Attack and cast speed if you`ve killed recently. The new flask "The Wise Oak" is super OP!!! 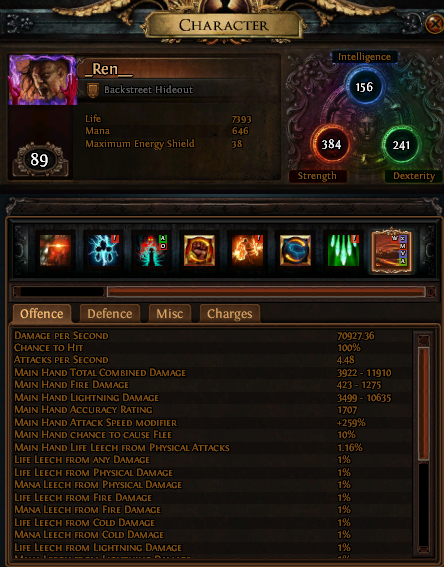 Just match all the uncapped resistances and you`ll have extra 20% pen and 10% reduction from elemental damage!!! Lions Roar will save you in tricky situations with a nice bonus of armor and MORE damage. Atziri promise will add a lot of damage due to our high phys damage and elemental damage. OP with this build. Just use it, it`s cheap. - damage, mace damage, two-handed damage, area damage. - attack speed, AS and cast speed, AS with two handed, AS with maces. The last gem would be either Elemental focus or Ruthless Ele focus gives consistent 49% more ele damage with 130% mana multiplier. Ruthless, gives 113% more damage to every third sequence of attacks (37% more damage on average) have 110% mana multiplier and you can apply shock. I've tested both and they are great, just pick one of them. 2 points are best - KILL EM ALL! There are still a lot of room for improvement like gems quality, better ammy/rings etc. First stream with new PC. 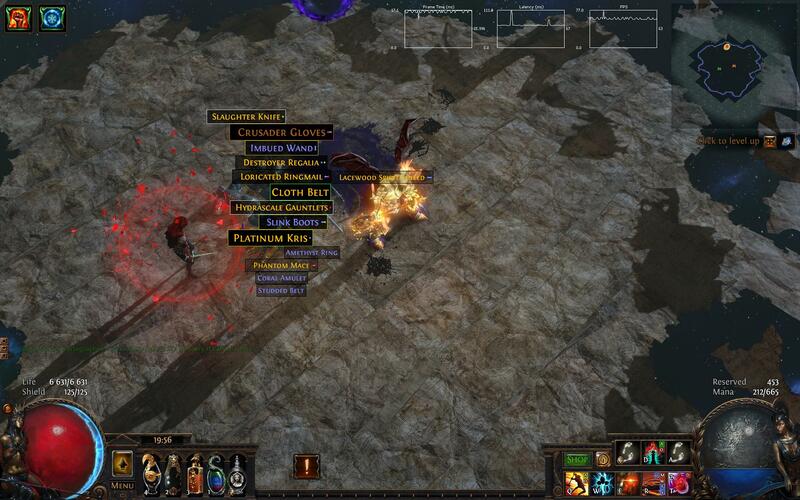 Beachhead T15 map boss fight! How do you keep up your mana? 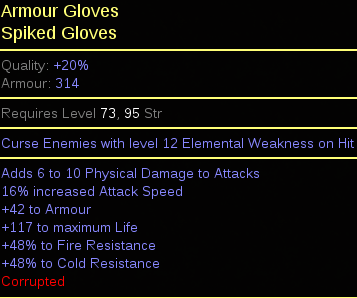 Glove enchant? How are you going to leech with the physical attack damage nodes if you plan to go 100% conversion? I'm curious on how you sustain yourself? Mana and Health wise. I assume with so much armor your life pool is adequate? Also, regarding Elemental Overload isn't it more cost effective, and generally better to just go with RT? I mean you're never going to miss. 40% damage cant make up for hundreds of thousands of dps can it? Edit:1 What about starforged? it has a lot more damage than that mace. You could always get jewels with %shock chance so you could still leech? and how do u think u come to 2m dps ? First of all, thanks for looking at my build guys. I really appreciate your help! I'm curious on how you sustain yourself? Mana and Health wise. Thanks for noticing, I totally missed phys leech. 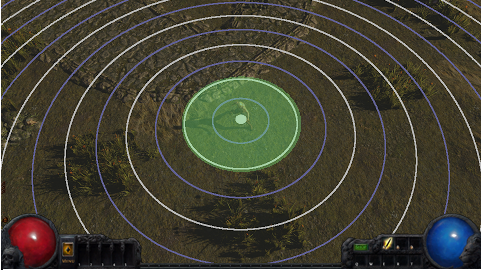 Currently, I`m leveling with Poacher`s mark. I`ve changed the tree to leech mana and life from attacks. I assume with so much armor your life pool is adequate? Also, regarding Elemental Overload isn't it more cost effective, and generally better to just go with RT? I mean you're never going to miss. 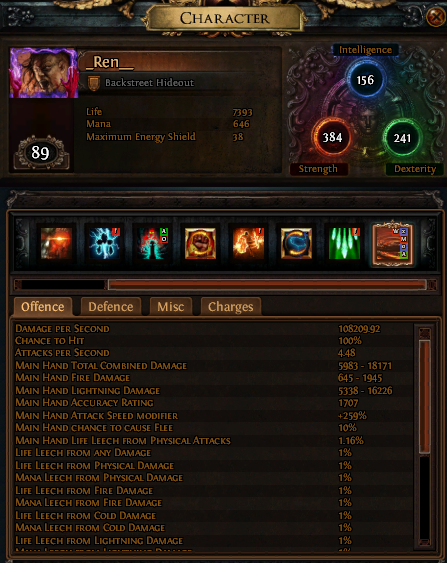 40% damage cant make up for hundreds of thousands of dps can it? Life pool will have around 6k hp. Depends on your gear. Also, without EO we will loose more than 100k damage in combat. I don`t like mainstream like Starforge, in addition, my build requires elemental damage, and Starforge deal NO elemental damage. It would be absolutely different build. Dude, I think I`ve counted my attack speed 2 times!!! OH MY, so we have only half a million dps output, but that`s still not bad at all. I`ll change the topic :D Thanks! I`ve thought on this build today, added different stuff like jewels, vaal haste, conductivity curse and a possibility to switch determination for Hatred.The output is crazy. 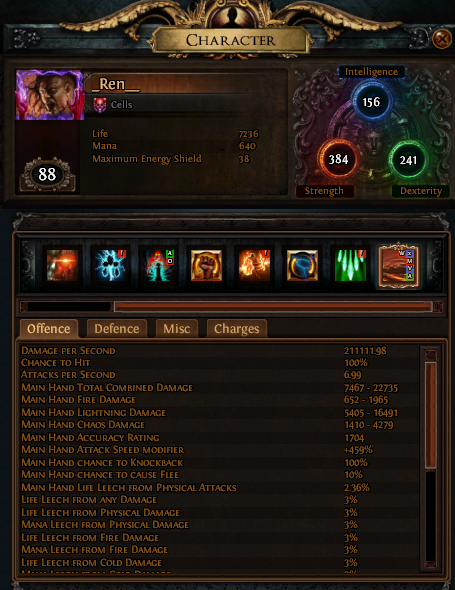 Almost doubled my effective DPS!!! 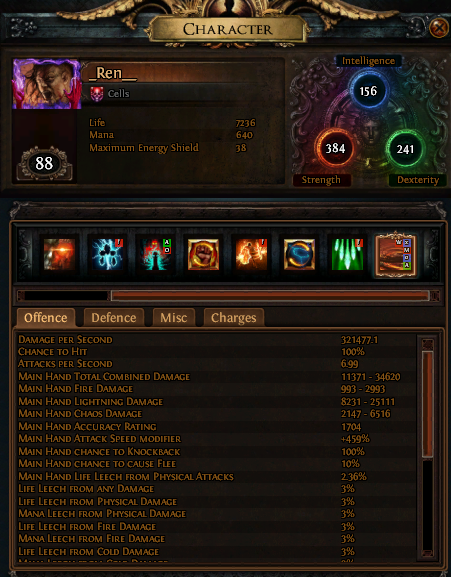 With Determination, you`ll have 53k armor/853k effective DPS. With Hatred 35k armor/979k effective DPS. noobsheet build, wish u a good reroll. Tested to lvl 80 with Berserker. Going really well! I might post some screenshots when 6l something.